On one hand, I'm not a fan of creating Sympathy Cards. On the other, it's nice to create a handmade card to acknowledge in a special way one's empathy with regard to the loss of a loved one. I really like the TIme Traveller collection and thought the prints and patterns would be perfect for just this occasion. 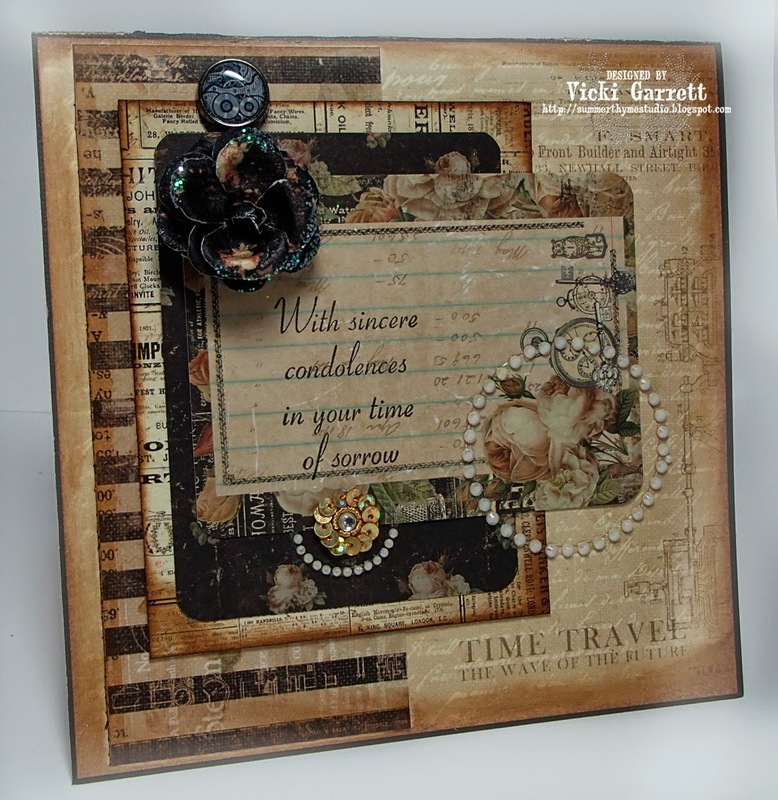 In addition to the Time Traveller Paper, I also used Time Traveller Tags and Tickets and 3x4 ATC Cards, Typewriter Keys and Flowers from the Time Traveller Collection. On the top card, I used a gorgeous Paintable, colouring in my flower with a Gelato. 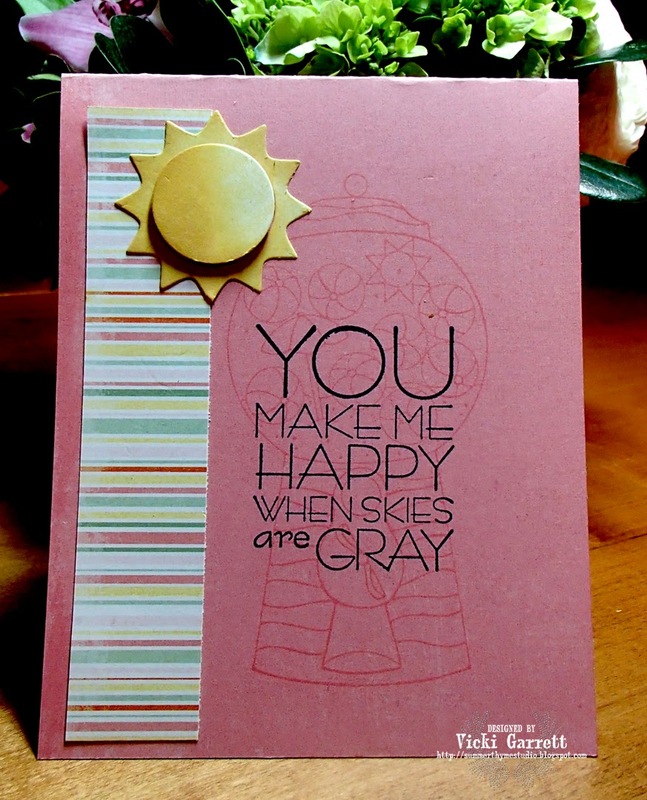 Sentiments for each card is from Impression Obsession. Good Morning! If you're in Canada, I hope you're enjoying a nice long weekend! I was out for my morning walk. I've been doing one-two walks per day and hope to increase the duration and intensity of my walks each day. Can't see myself becoming a runner, but a good brisk pace would be good! 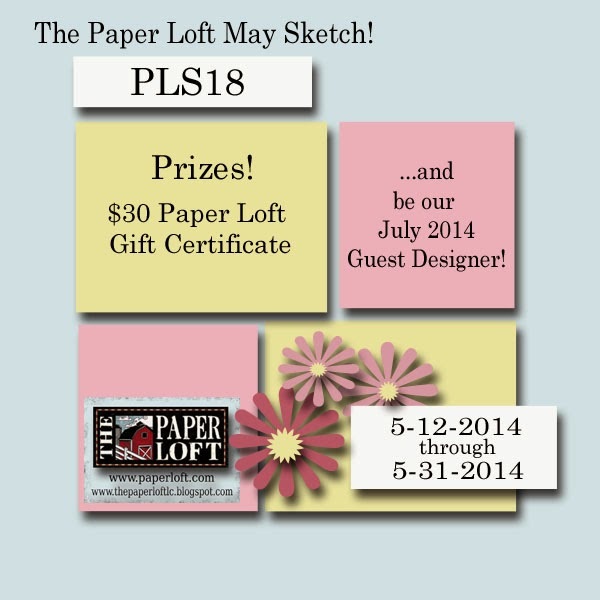 It's May Sketch Time over at the Paper Loft! 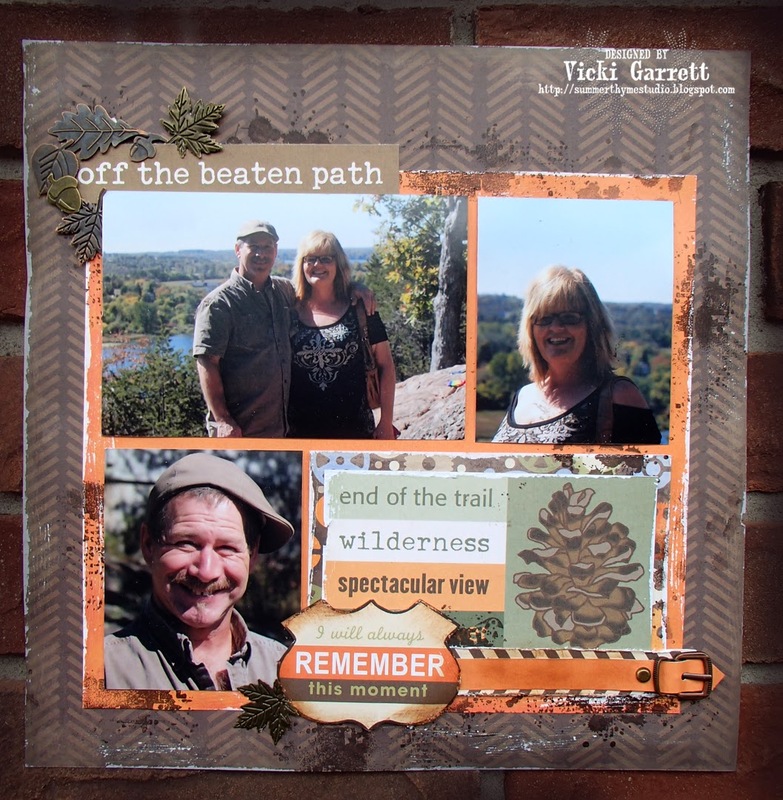 Create a Layout using your Paper Loft Papers and you will have to opportunity to win a gift certificate AND a spot as July Guest Designer. How cool is that??? I used the extra paper to create this fun card!! 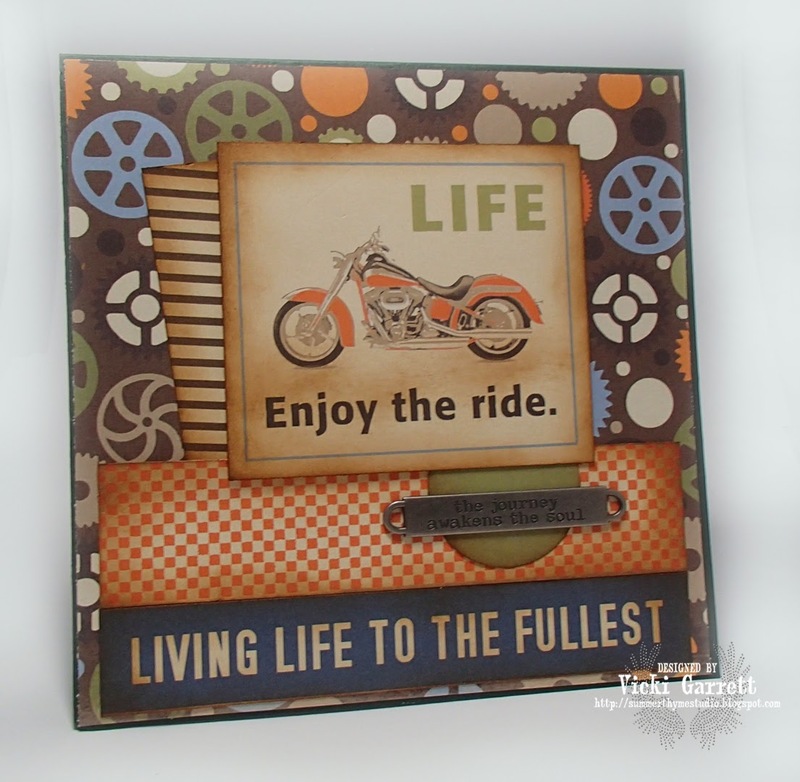 and used this cardstock accessory sheet to accent my card!!! Hope you have an amazing weekend!!!! I am SO Happy that we are enjoying warm and sunny weather here! The sentiment of course was perfect to relay my song choice! 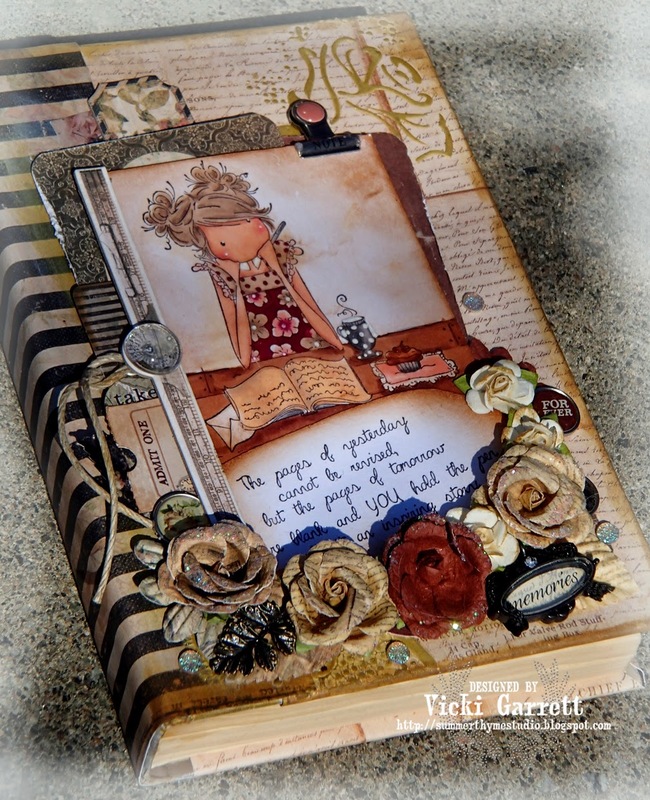 I used Truly Scrumptious Paper from The Paper Loft both in the base and the accent pieces of my card. All of the Impression Obsession Design Team are playing in the challenge today! 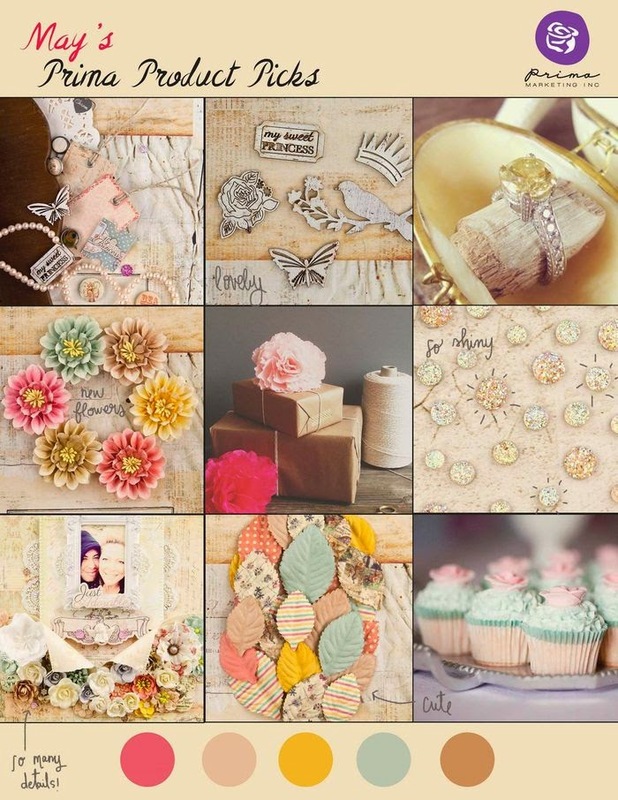 Be sure to follow the links on my side bar to view their fabulous creations! To enter the challenge, please see all the details on the IO Blog. Have a wonderful day! 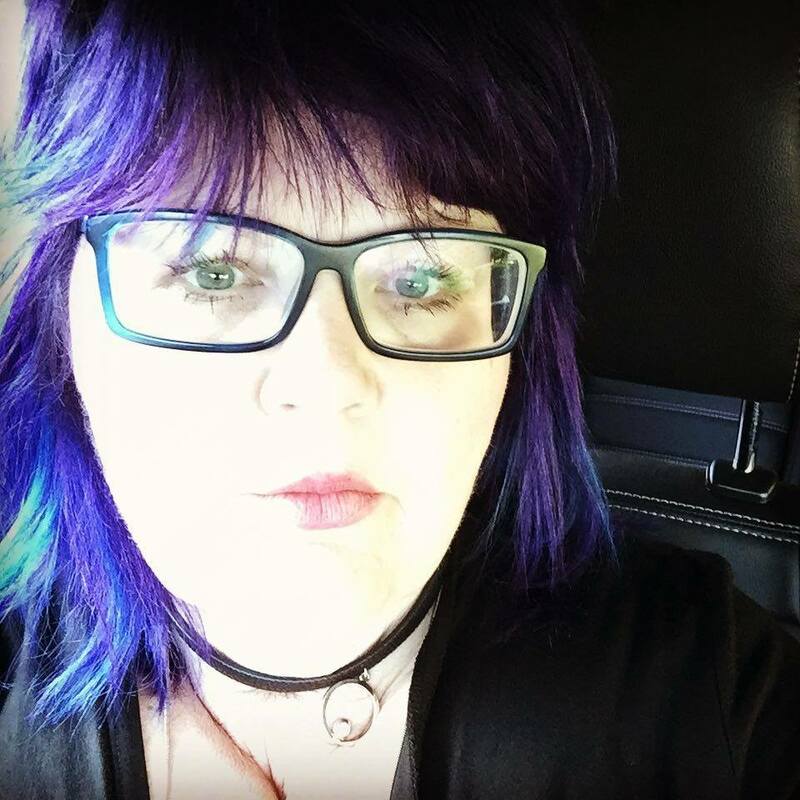 If you've been following my blog or Facebook updates, you'll know that I'm currently recovering......I've decided that rather than recovering, I will be Transitioning. That was my first step. In the Hospital I was offered smoking cessation aids, resources, literature. In order to move forward, each step will be followed by another. 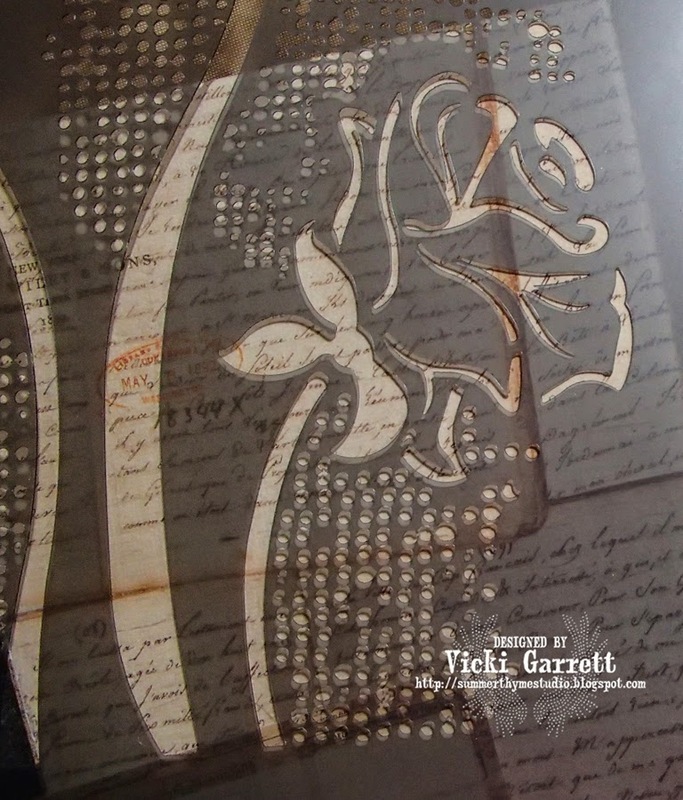 I created this cover for my Transition Journal in which I will record my goals, successes, Inspirations etc; Quotes that give me strength, Affirmations to push me forward in my quest for more Balance in my Physical, Emotional and Social States. 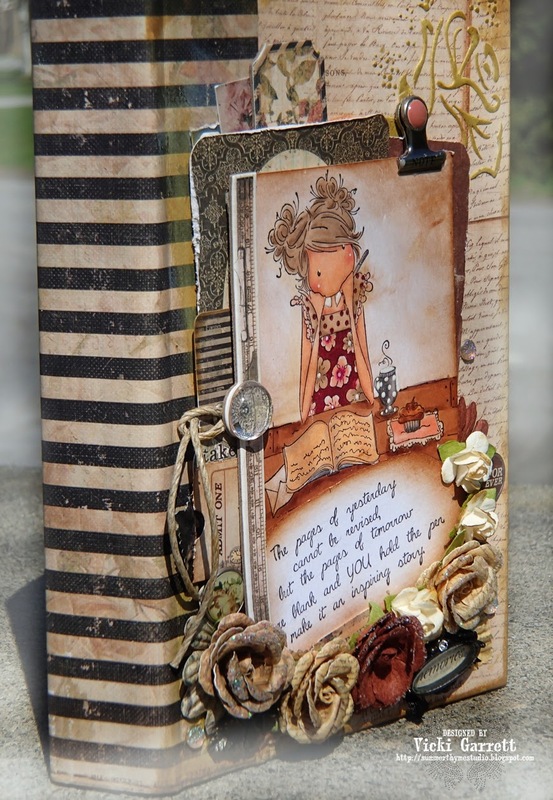 In seeking a Central Image for my Altered Journal, Jayden loves to Journal from Stamping Bella couldn't be more perfect! "The pages of yesterday cannot be revised, but the pages of tomorrow are blank and YOU hold the pen. Make it an inspiring story. I will make it an inspiring Story, a Story that I will continue to share well into my Eighties, for I hold the pen; I can make the difference between living and living well. 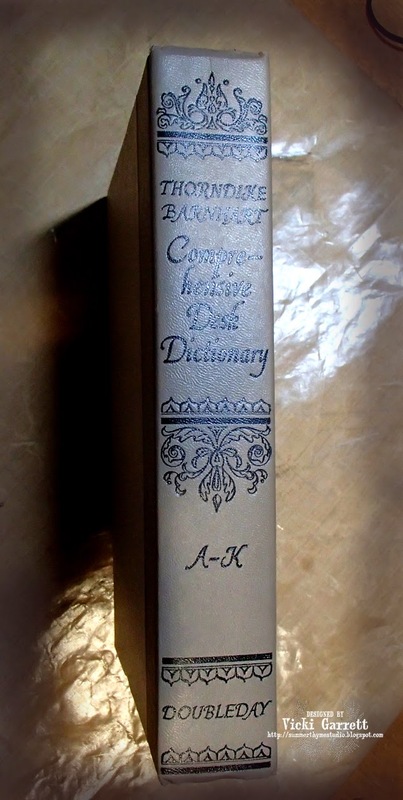 I started with a Desk Dictionary that I found in the Cedar closet. I tore out about 1/3 of the pages and glued several groupings of pages together as a start for my first entires. 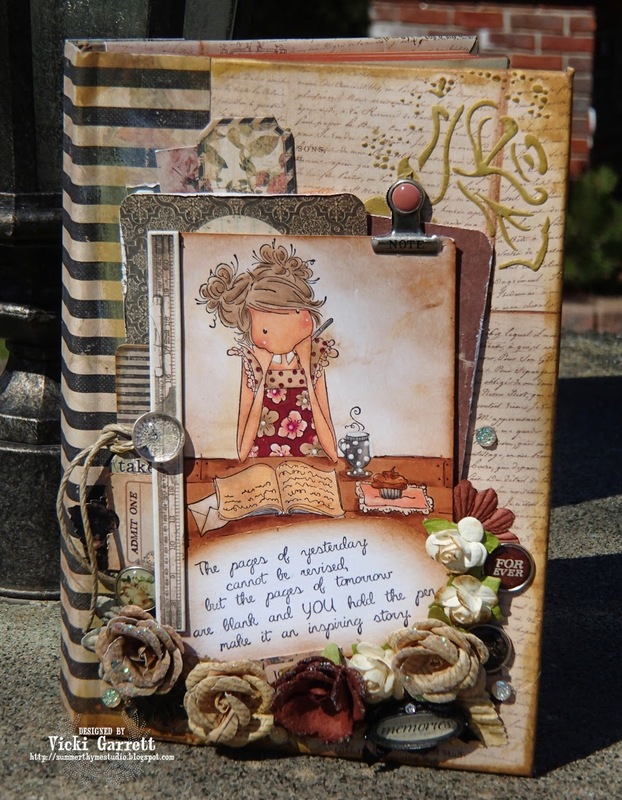 I love the Colours and elements of the Prima Marketing Time Traveller Collection and decided to use it primarily in the construction of my Journal. 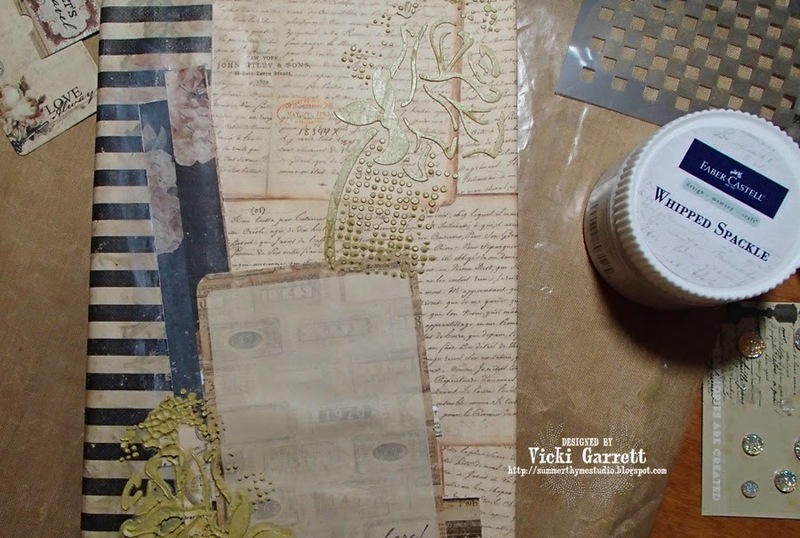 I then adhered a 4x6 Journal Card around the mid point of the front cover. 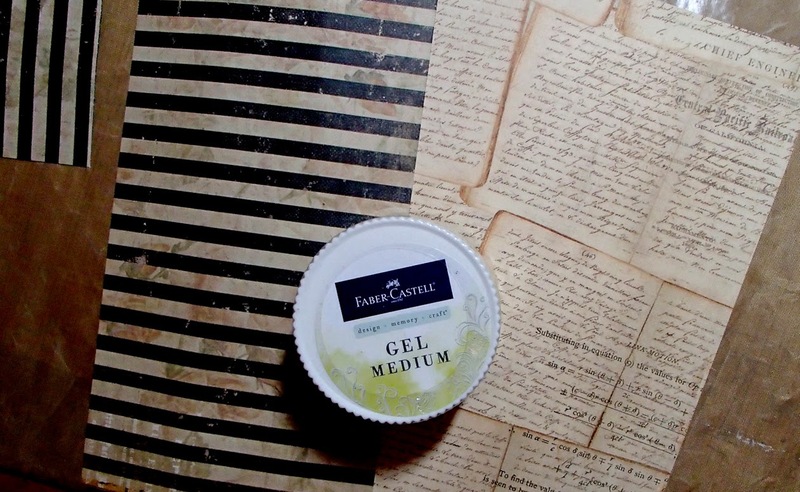 Once the Covers were attached, I cut a slice of Gold Gelato and as in the illustration below, mixed it with the Faber Castell Whipped Spackle to create some coloured Texture Paste. 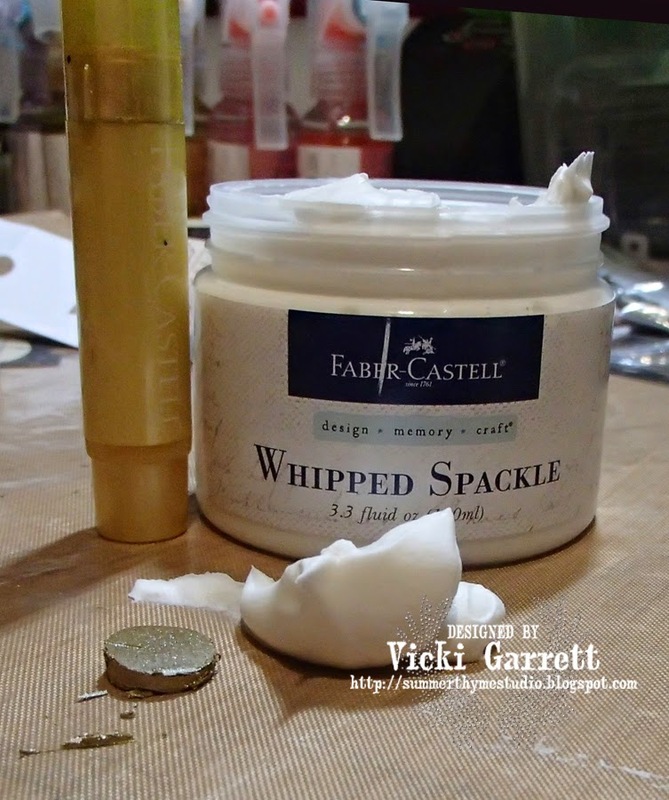 The Whipped Spackle dries quite quickly! That's great for me as I can be a touch impatient at times! I hope you've enjoyed my post. I am looking forward to sharing the pages as well as some of musings with regard to my lifestyle change. How will you be Celebrating this Special Day? We decided to have a BBQ at home. Ribs for the Fam, Salmon on a Cedar Plank for me and anyone who wants to share!!! My Mother is my Rock! I've said it before, but I wish I was half as strong as her. I am so blessed that she is young at heart and loves to Travel. We've enjoyed a trip to Grenada this Winter and have travelled somewhere the past three years! 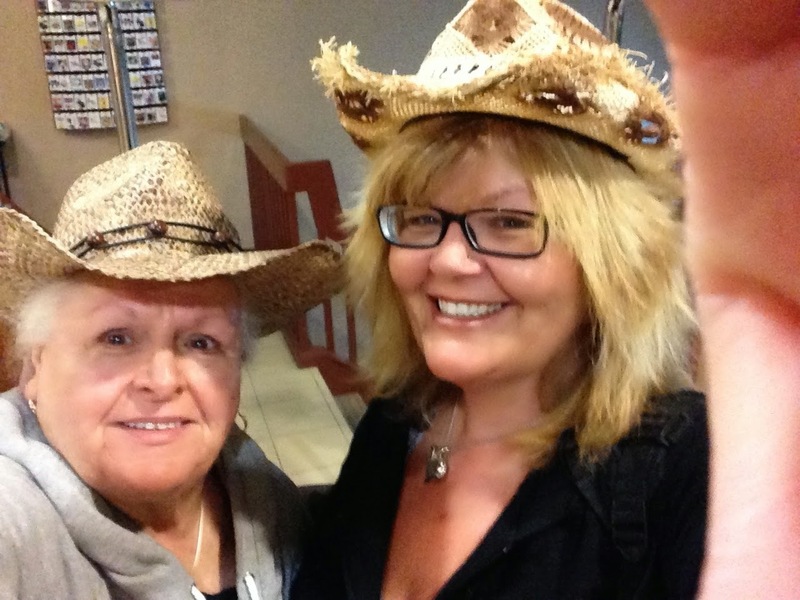 Here we are awaiting our Shuttle at the Hotel in Toronto in February! Happy Mother's Day Mom!!!!! I am proud to be your Daughter and Thank you for your guidance, kindness and unconditional Love! 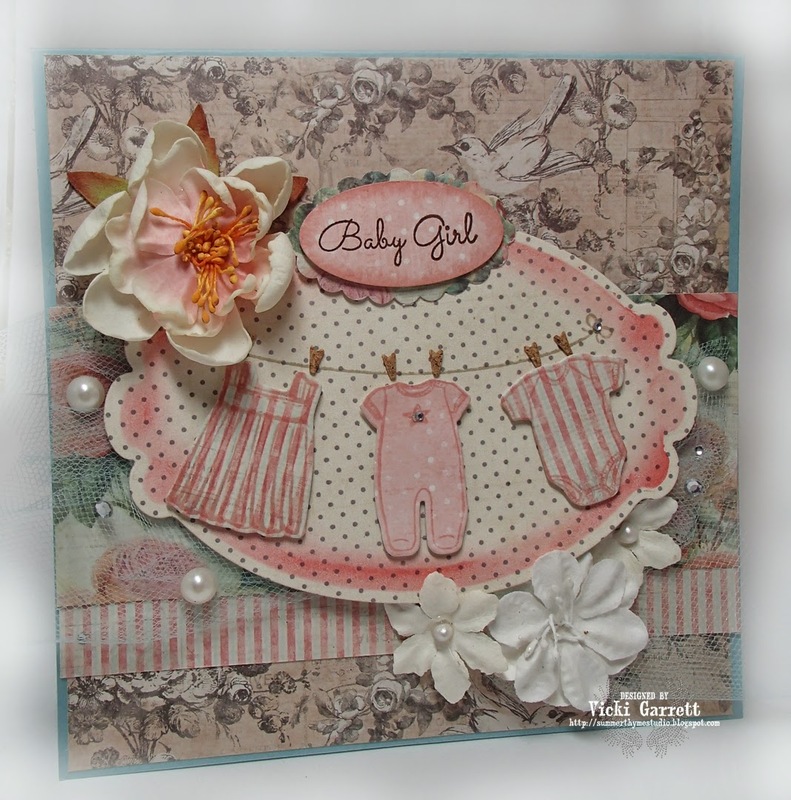 I used Prima Marketings May Challenges as an Inspiration for my Card. the gorgeous Prima Princess Collection. For the base layer I used Sophia. 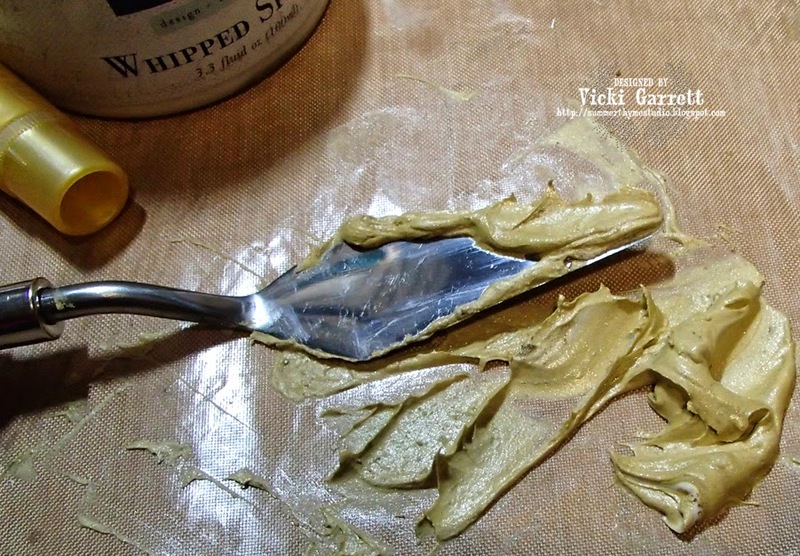 I took the yellow metallic chalk edger and sponged through the stain stencil. there is a small panel under the meshing that I cut from the "Mia" paper. 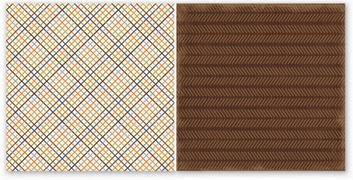 The small panels from "Princess Collage" worked perfectly for the sketch I took the metallic yellow chalk edger and went along the border of each. 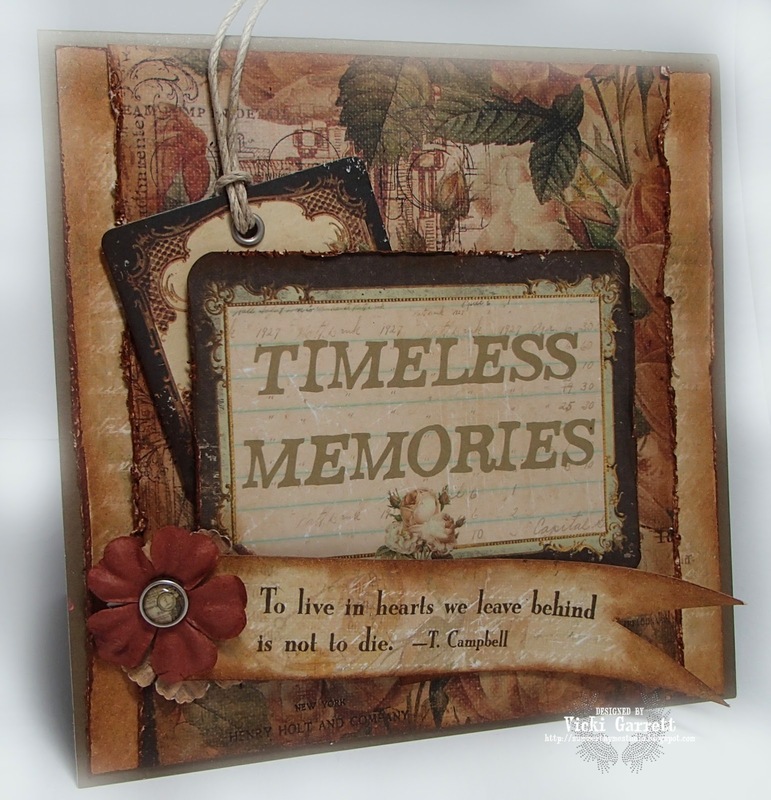 In addition to the Princess Papers, I used the small stickers that are found in the Seashore 12x12 collection pack on top of the Life Time Wood Embellishment Clothes pins. 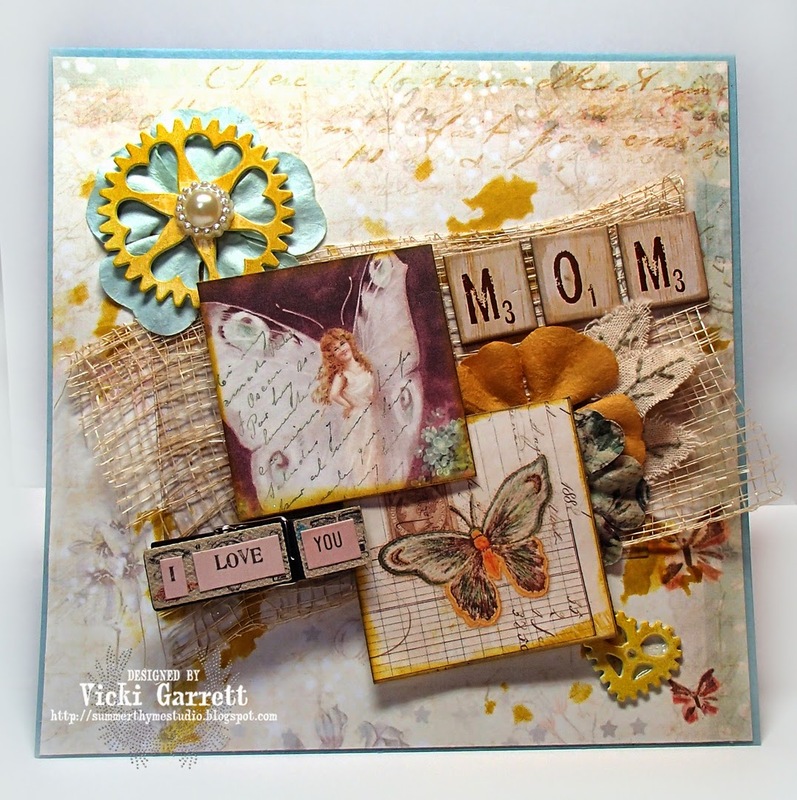 I used the Junk Yard Finds Heart gears, which I sponged with the Yellow Metallic Chalk Edger and Heat Set. I also used Time Traveller Flowers along with Grove Beige leaves. to finish off the elements of the sketch. I will have poetry in my life, because I can. I will have adventure in my life, because I will allow myself to. I will have Love in my life, because I do. I realize even more, after having this health scare, how blessed I am to be loved by my small Family and Friends. The calls, texts, visits, cards and flowers mean so much to me. To know that so many people care is almost overwhelming. Their investment in me strengthens my will to invest in myself. Working to get stronger and healthier will obviously be of benefit to myself, but also will allow me to be strong for those that I love. I'm feeling blessed to be enjoying the sunshine today and more determined to do what I need to get healthy and strong! 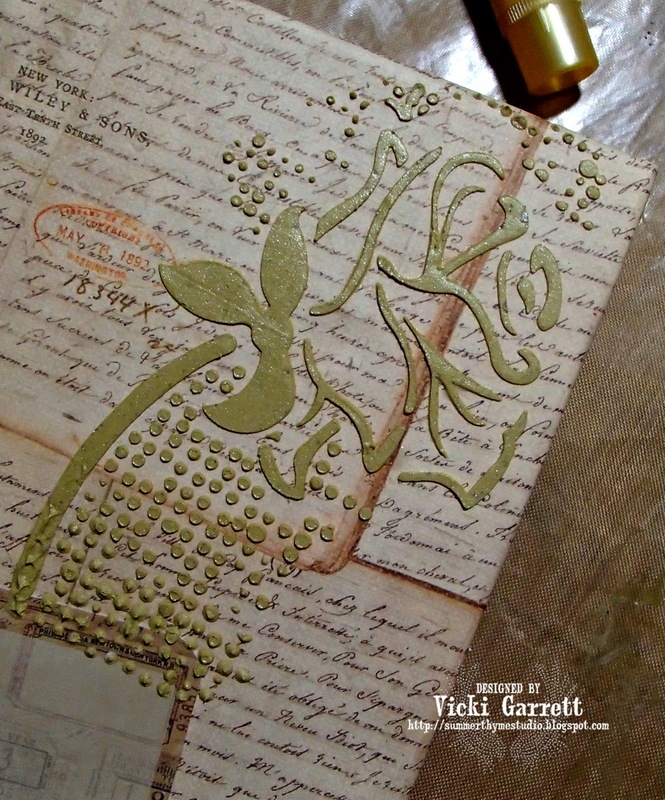 I created this watercolour background using Tim Holtz Distress Ink and a Stencil. 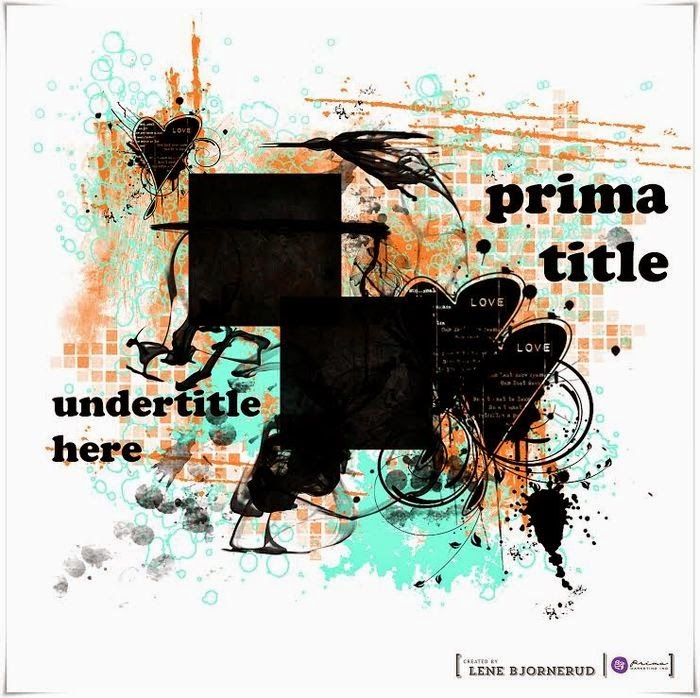 As I have probably mentioned before, I am Over the Moon CRAZY about the Prima Marketing Seashore Collection~ I have many elements of the collection already and have a box on it's way to me from Scrappin' Great Deals! 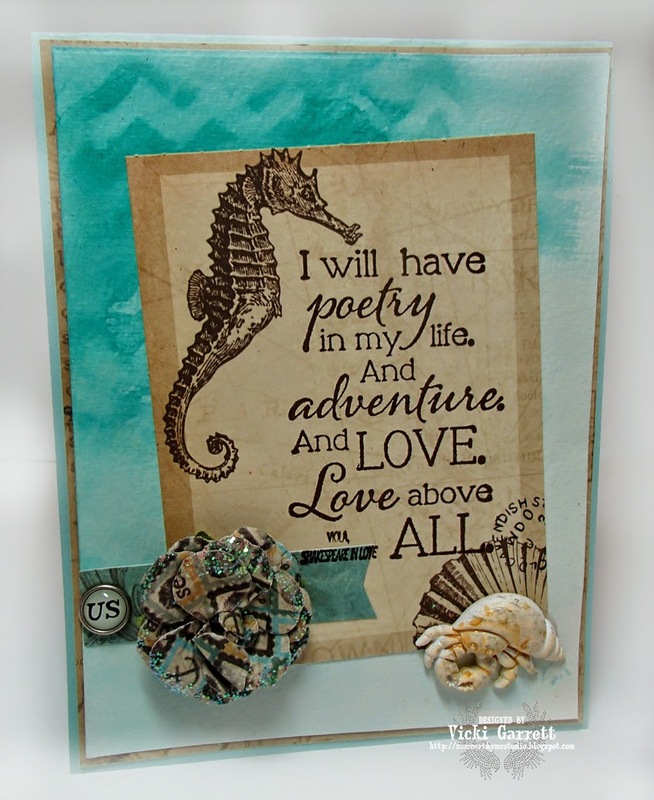 I cut the Seahorse Panel from the Sea Memories Designer Paper Sheet. 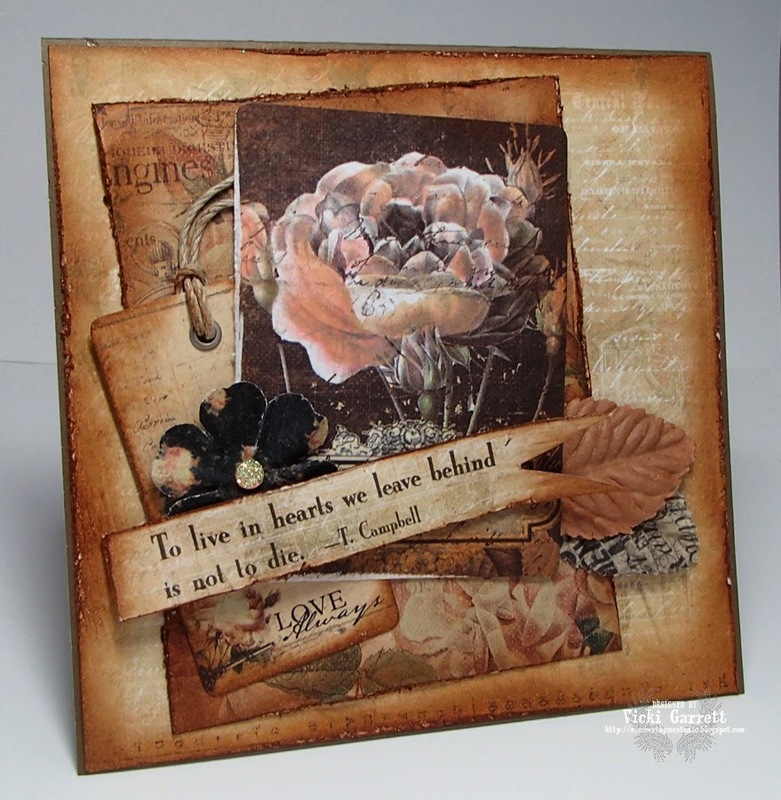 I stamped the Love above All sentiment from Impression Obsession Stamps and adhered the Panel to the main card. I added a Banner Sticker from the Sticker Sheet in the 12x12 Collection Kit, as well as a pretty flower from the collection and a tiny metal brad from the Time Traveller Collection. I then dabbed some Pastel Peach ink over the tiny resin crab with my chalk edger. I heat set that and sprayed with gold foil Color Bloom Spray. You'll be seeing a lot more of the Seashore Collection as I've decided in the spirit of needing to be more calm cool and collected, I've decided to redecorate my room in a beach side theme! More to come on that, but I plan to make some fun art and accent pieces while I'm off recuperating! Hope you all have an amazing day and remember an adventure doesn't have to be comprised of huge events, travels and interactions..... you can pursue adventure where ever you may be...it's all in your attitude and perspective!!!! Hope this post finds you well! I've been missing in action again.The Saturday before last, I had a Health Scare. I had been having these odd spells of pressure in my chest, coupled with dizziness, nausea and fatigue. I had been raking some heavy pine needles on Sunday and Monday and thought that I had pulled a muscle. By Wednesday, I thought that perhaps I had Bronchitis. I took a trip over to the walk in clinic, but on that particular evening was greeted by a note on the door indicating that they were closed early just for that night. I shrugged it off and continued to have these spells all week. By Saturday evening i had experienced a few more spells and it seemed that my recovery time was extended with each spell. With some convincing, I decided to head over to the urgent care centre, figuring that I would get checked out and sent home with a diagnosis of a pulled muscle. It's not funny, but in the past year, I took both my Mother and Son into the hospital for chest pains. Both were taken in immediately and both sent home with a clean bill of health. Bronchitis for my son; a pulled muscle for my Mother. I was suprised when I was asked to take a seat in the waiting room and didn't get called into an examination room for about forty minutes. That being said, on another level, i felt fairly relieved about that as i figured that the triage nurse must not be very worried about, therefore I would be okay. Boy was I wrong! Once I explained my symptoms to the Emergency Room Dr. , I was hooked up for an ECG and whisked to Xray. I knew there was some cause for concern when rather than just drawing blood, I was being prepped with a pick line.....ugh. 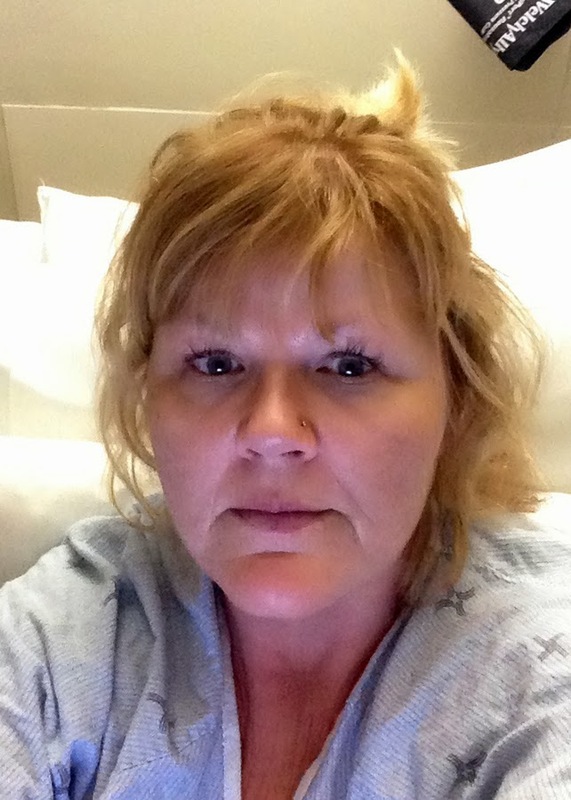 The next thing I knew, I was being loaded into an Ambulance to be transferred to Kingston General Hospital to be admitted. I had been diagnosed with a Heart Attack. SCARY............To think that if I had continued to ignore the warning signs, I may not be writing this post at this moment. To think that without some convincing on Paul's part, I might not have taken the trip to Hotel Dieu to get checked out. I don't even want to think about it. To make a long story short, I was in the Hospital until late Thursday afternoon and after undergoing an angiogram, had two stents place in my heart. My wake up call! 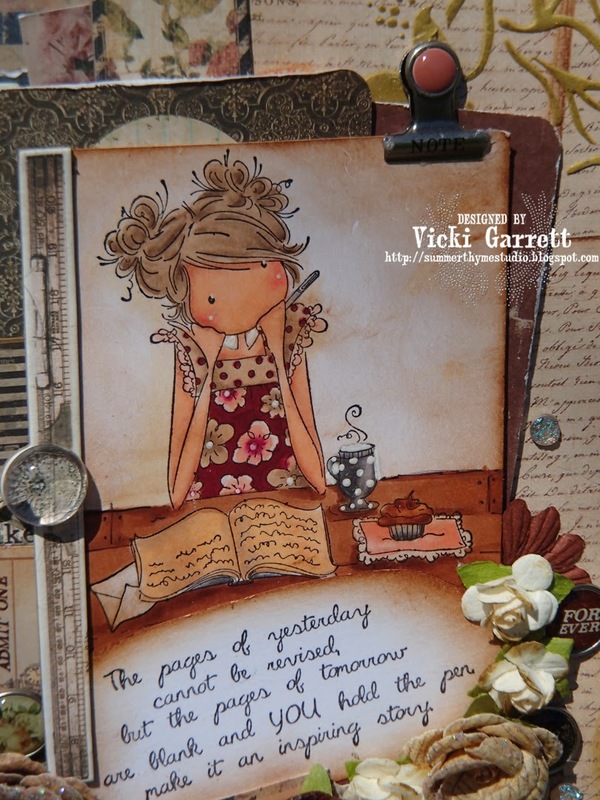 I am blessed to be here creating cards, to blog, to breathe, to sing and in time to dance. My new lease on life. My opportunity to be healthier and truly look after myself. I'm committed to making each and every day count! I'll be home for a month, resting and recovering, so be prepared to see many creations as I am pretty much grounded to the house ( I can't drive for a month). Creating is my Solace. 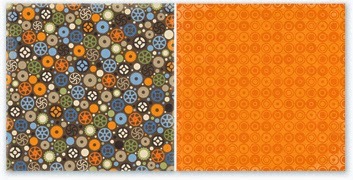 I am Featured Designer for IO Stamps this week.